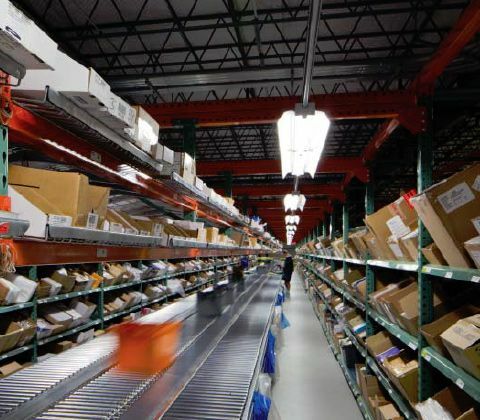 So you need high density storage for a fast product turnaround and a small amount of product types. 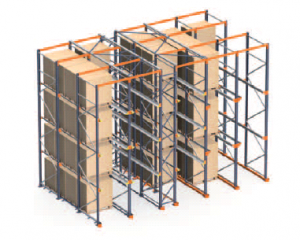 It sounds like the Drive-In pallet rack system could be a good option for your facility. I will be explaining this system in more detail for this post. 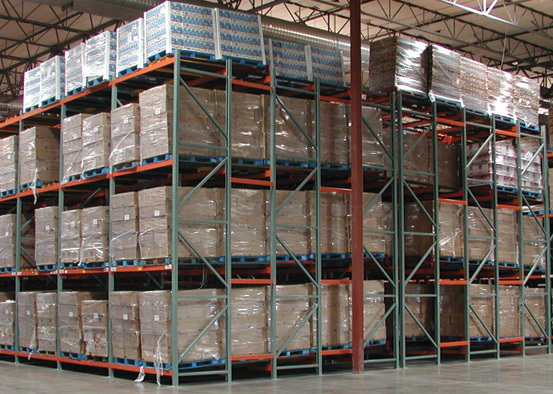 The Drive-In system is used for storing a high volume of pallets, and these pallets are usually the same. This system allows for maximized use of area and height, giving it a lot of extra storage space. 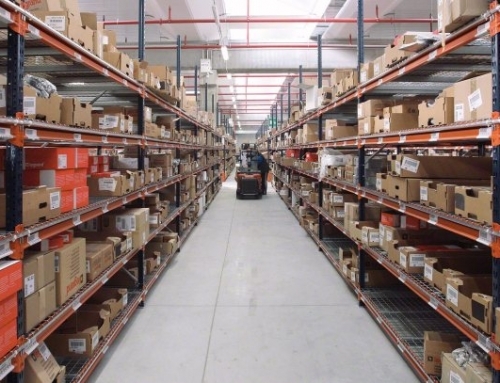 The pallets are placed one after the other, which is why it is best to have the same products in a bay, because this is a LIFO (last in, first out) system. 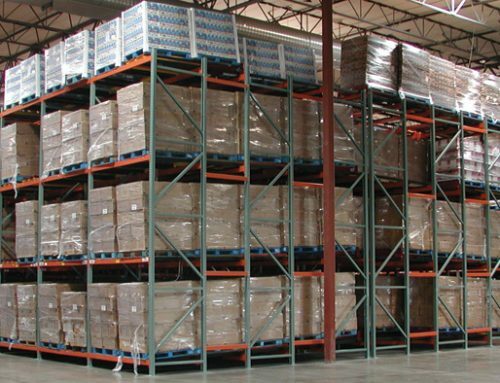 The pallets must be loaded from back to front and bottom to top (and unloaded from front to back and top to bottom) to keep the stability of the system. In this system, bays are also called lanes. 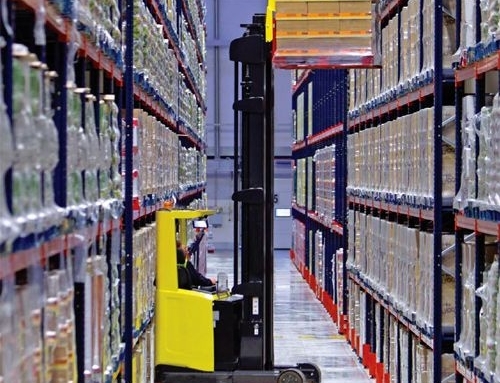 The forklifts enter internal lanes to deposit the pallet in the correct position (hence the name “Drive-In”). 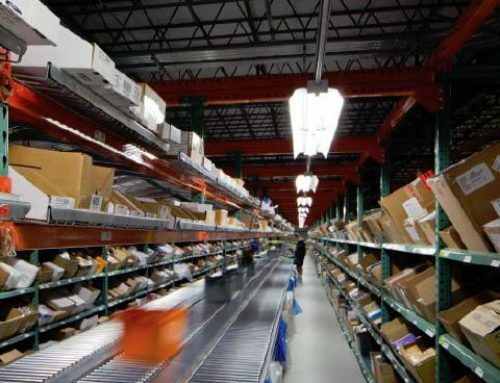 The depth of each lane depends on the number of pallets per product and the length of time they will be stored. 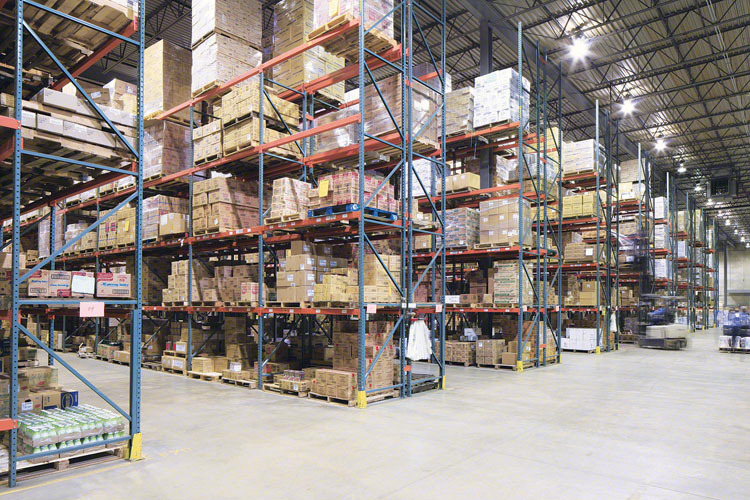 Drive-In systems can hold up to 75 percent more pallets than selective pallet rack. This system consists of a frame, top tie beam, arm, foot plate, shims, anchors, horizontal bracing, vertical bracing, and rail. Guide rail is used on the floor to make sure the forklifts stay in their lanes. 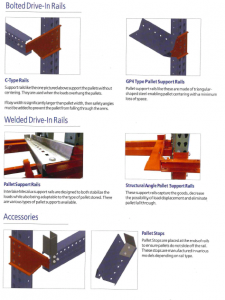 Rail is what the pallets rest on, and there are many different types depending on the type of pallet. 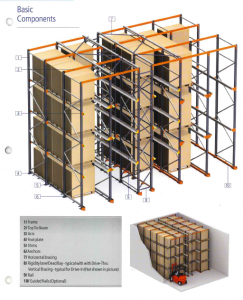 Generally, structural rack is used in this system because it is more heavy-duty. I’ve added a few pictures below to help illustrate the components of Drive-In rack. Drive-In rack is very customizable, since you don’t need multiple aisles and the entry and exit points are the same. 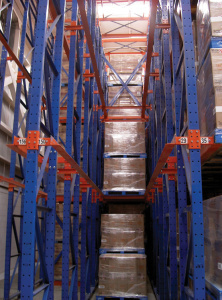 A variety of heights and depths are available depending on the products stored. Because the forklifts drive-in the lanes with the pallets in them, extra aisles are not necessary and save space. 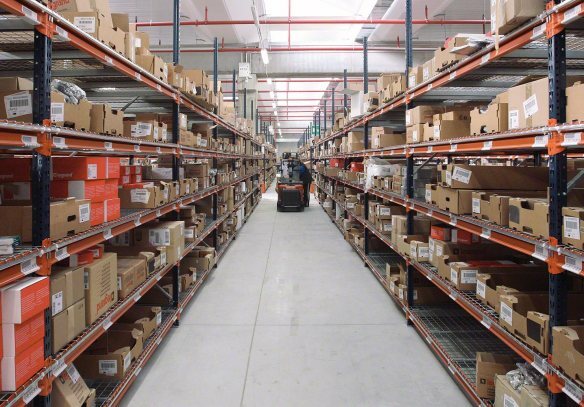 Because the pallets are stored so densely and the forklifts actually have to enter the bays, the Drive-In system must be checked frequently for damage. In addition, the forklift operators must be highly trained and able to maneuver these small storage lanes with the pallets. Certain measurements must be kept in mind when calculating the clearances they will need to work safely. The most important factor of Drive-In rack systems are the forklifts. As stated in the safety section, measurements must be calculated while designing to be sure that they are able to move around in the storage lane. 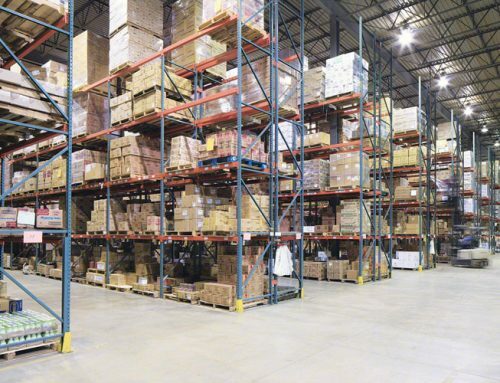 Another important piece is how many different products you will be storing, and if they contain time sensitive materials, because the depth of the bays will depend on that. 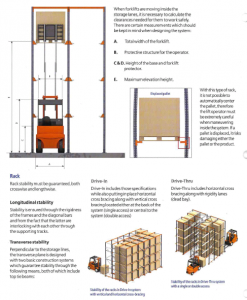 Because this system is so customizable, it can be designed to suit your forklifts and pallets. 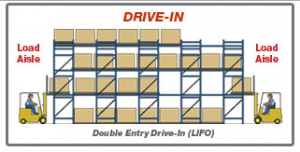 Drive-In systems require extra space at the top for overhead bracing, so, as always, basic information about your warehouse space is necessary, like the height of the ceilings, and if there are columns, sprinkler systems, and/or hanging lights. Next week, I’ll be going over Push Back rack. Be sure to look back here for more information. If you have anything else to add please leave a comment! Our updated website is live and we can’t wait to hear what you think about it! Check out our website and contact us for more information!